6964 Mini Boba Fett's Slave I is a Star Wars mini model of Boba Fett's Slave I released in 2004. The set is the same design for the Slave I in 4487 Mini Jedi Starfighter & Slave I, just in a different colour scheme. 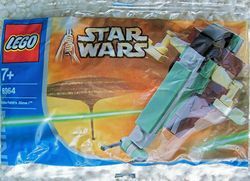 The Slave I is an exclusive for certain retailers, including Japanese candy company Kabaya (who sold it with bubblegum). X-wing (set 6963 X-Wing Fighter) and TIE Interceptor (6965 Mini TIE Interceptor) are also Kabaya exclusives. Front of the Kabaya release box. Back of the Kabaya release box. Facts about "6964 Mini Boba Fett's Slave I"
This page was last edited on 15 March 2016, at 06:01.